Value for money is a problem we often try to solve when shopping: "should I get the larger bottle?" Get the best bang for your buck! Our price / quantity calculator lets you compare products with various quantities and prices. Imagine that you're in a shop trying to decide which product is the best deal (is sold with the lowest margin), this is a tool for you. For example, you want to buy some flour. You can choose between a smaller package - 1 kg for 1$ and a bigger one - 1.5 kg for 1.35$. Which one is a better buy? 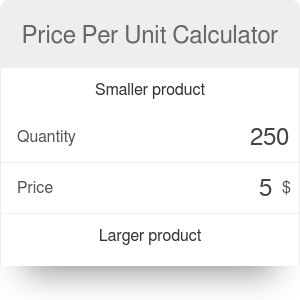 Thanks to using price / quantity calculator you know that the unit price in a larger package is 0.9$. The "You Save" box tells you how much more you'd have paid if you bought the same quantity at the price per unit of a smaller item - in our example - 0.15$. If you want to know how much you will save on an offered discount you might want to check out the discount calculator. In some countries and stores, the price per quantity information is provided on the price sticker. So you might want to take a closer look and not need the calculator at all. Still, you might find yourself in a situation where that's not the case, for example when the pricing comes up in a conversation. Value For Money Calculator can be embedded on your website to enrich the content you wrote and make it easier for your visitors to understand your message.